There’s a set of good large sedans that offer plenty of space, comfort, performance and safety for a reasonable price. For those who like to drive a large sedan that’s a little more special than the run of the mill buys, then you’ll be looking at what the 2017 Honda Accord has to offer. Choose the 3.5-litre model, and in this price bracket, the stylish new Honda Accord competes directly with the Skoda Superb TSI 206 kW sedan, Peugeot 508 Diesel donks and Citroen’s C5 stylish sedan. 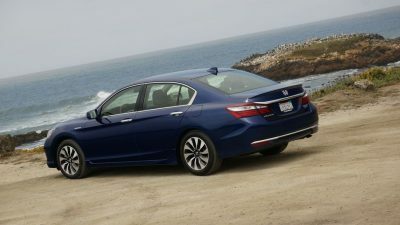 Amongst this sort of competition, the Honda Accord Sedan stacks up well with plenty of power, room and safety. If you’re on a budget in the V6 3.5-litre bracket, for less money you could own a Toyota Aurion or Subaru Legacy with similar V6 3.5-litre grunt. Like the looks but are happy to run with a smaller engine? Then the Accord 2.4-litre VTi and VTi-L sets up against the Hyundai Sonata, Holden Malibu, Kia Optima and Subaru Liberty – to name a few. So, does the new Honda Accord punch hard enough to earn the right to be a class leader? Let’s take a closer look. The new Honda Accord is well designed with balanced style and flowing lines. Some would say the 2017 Accord exterior is a little conservative in its wow factor ability, but this is not to say it is ugly. With a few tweaks, Honda’s 2017 Accord has a freshened-up appearance with some subtle changes to the Accord’s front and rear ends. The nose embraces a new ‘wing’ chrome strip on top of the grille. New front headlamps feature a new LED cluster arrangement, and the fog lights are now LED and lodged within a lower-positioned bumper. At the rear, the Accord’s tail-light lenses are accompanied by a wider chrome strip. The lower rear bumper’s chrome strip is also stretched further across than previously. 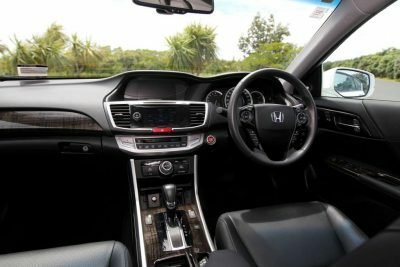 Smooth style is what the new Accord provides, hiding the very roomy cabin nicely in the sensible proportions of the large sedan styling. You can easily seat five tall adults inside the new Accord with plenty of room in the back seats around occupant’s shoulders, head and buttocks. Leg room in the rear seats is outstanding. While on the subject of seating, another likable aspect of travelling in the Accord is that the seats are comfortable and capable for providing long distance comfort. The new Accord leather seats look great and feel even better. Ergonomically excellent, the Accord still has one of the simplest dash designs that is easy to use and looks good. A multi-function steering wheel has buttons for audio, Bluetooth hands-free communication and active cruise control. The neatly designed analogue speedo and rev counter are some of the easiest to read and most pleasant on the eye that are available in a new luxury sedan. Chrome trim, leather and wood inserts put the icing on the cake for what is a very nice large sedan interior. A premium finish with quality materials keep the rest of the new Accord cabin looking first rate. There is a whole heap of top equipment that comes as standard kit for the Honda Accord 2017 VTi-L sedan. Electronically adjustable, heated front seats and electric rear sun shades come as standard. Android or iPhone users can now seamlessly integrate their device to the Accord’s touchscreen display. Get directions, make calls, send and receive messages, listen to music and even interact with some of your favourite apps become a breeze. Siri Eyes Free or Google Voice Search functions means that you can do most of these tasks without ever having to take your hands off the steering wheel. All you have to do is ask and the Voice Commands take over. The 7-inch interface display screen is very nice to use and with easy hand actions, the touch screen flicks between functions really nicely. Advanced technology is a Honda strength – always has been. The 2017 Accord comes standard with Garmin Satellite navigation, and thanks to SUNA>live traffic updates, you’ll in the traffic know. Even in 2.4-litre guise, the equipment includes: 12-Volt power outlets, 17-inch alloys, Active Noise Cancelling, an alarm system/remote with anti-theft functions, an ambient temperature display, Android Auto, an antenna in the rear glass pane, Apple Car Play, automatic climate control with dual temp zones, AUX/USB Input Sockets, Blind Spot Monitoring and Bluetooth Connectivity. If you opt for the bigger V6 model, then some other luxury extras include hydrophylic door mirrors, twin exhausts, a boot lid spoiler, side skirts, 8-way adjustable front seats and, of course, the 206 kW engine. Safety is five-star and includes: ABS, Brake Assist, Daytime Running Lights – LED headlights, dual front airbags, Electronic Brake Force Distribution, an Electronic Stability Program, head airbags, LED rear lights, a reversing camera, seatbelts with pre-tensioners in the front seats, seatbelt reminders and curtain side airbags. The entry-level VTi and VTi-L Accords continue to be powered by the efficient 2.4-litre four-cylinder engine with 129 kW and 225Nm of torque which is linked to a slightly dated but good five-speed auto. These are priced around $33 k and $44 k respectively. Honda’s Accord V6L model features the silky six-cylinder V6 with 206 kW and 339 Nm, and carries a $53 k price. The V6 is matched to a very smooth six-speed auto. V6 engines use around 9.5 litres/100 km, while the 2.4-litre can average around 8 litres/100 km. Loaded with equipment, very quiet to ride in and with Honda reliability, the 2017 Honda Accord is very easy to live with and easily a market segment leader. For any more information on the 2017 Honda Accord or, for that matter, any other new car, contact one of our friendly consultants on 1300 303 181. If you’d like some fleet discount pricing (yes even for private buyers! ), we can submit vehicle quote requests out to our national network of Honda dealers and come back with pricing within 24 hours. Private Fleet – car buying made easy!